Guy “THAT GUY” Robinson, Stylist, started his career in beauty three decades ago. He first graduated the Regency Beauty School in Philadelphia, PA and then furthered his education at Vidal Sassoon in London, England and worked with Paul Mitchell. Guy has owned three high-end beauty salons throughout his career. His first salon, That Guy for Beautiful Hair at the Marriott Hotel in Bala Cynwyd, was where he did most of the hair for local TV personalities. Joan Dinerstein and the entire Channel 10 News Team along with many celebrities including Joan Rivers and the cast of Happy Days have been Guy’s clients. He hosted many top hairstylists in his salon including Toni & Guy, John Dellaria, and Vidal Sassoon’s Artistic Team. His second salon opened in Spring House, PA called That Guy Haircutters & Haircuts for Peanuts, the first environmental hair salon for children, gained international recognition. His third salon, That Guy and Company Haircutters, opened in Southampton, PA. All three salons were members of Intercoiffure America. Guy Robinson is an extremely celebrated hair stylist. He was elected President of The Philadelphian Hair Fashion Guild and also was referred by Congressman Peter Kostmayer to cut Amy Carter’s hair (President Jimmy Carter’s daughter). Guy has been on many television shows and has been written about in many magazines such as Harpers Bazaar, Hair Do & Beauty, Parents Magazine, Philadelphia Magazine, and Hair Styles & Care where he was featured as The Best of Philadelphia.. He also produced the first instructional movie called Wash & Wear Hair to teach woman how to blow dry their hair. 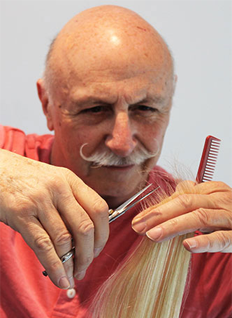 Guy loves to cut and style hair so much that in 1975 he cut hair for 100 hours to break the Guiness World Book of Records! He has continued his education working at Taire Hair Salon next to the creative director and is always a motivating force to give the best to his clients.